Although it may be difficult to imagine, HEI researchers made these nanoscale drug delivery agents even smaller. By changing our existing nanoparticle formulation process, we have fabricated drug-loaded nanoparticles that are 50% smaller and even more biocompatible than our pre-existing formulation. The reduced size and improved surface features of these second-generation nanoparticles has enhanced both diffusion across the round window membrane and cellular uptake within the cochlea, which was a significant technical milestone in our development program. So how do the nanoparticles get to the cochlea? 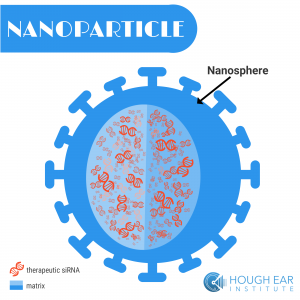 By suspending our nanoparticle formulations in a temperature-reversible gel solution, we can inject therapeutic nanoparticles across the ear drum into the middle ear space, wherein the gel solution solidifies and is retained for several days. Over this time period, nanoparticles are released from the gel matrix and can diffuse cross the thin partition that separates the middle ear from the inner ear, called the round window membrane. We conducted experiments to see if these exciting new smaller drug delivery agents would move out of the gel solution and into the cochlea where they will deliver their hair cell regenerating technology. To do this, we dyed nanoparticles of the same size and composition as our therapeutic nanoparticles with a fluorescent coloring to see if they would travel across the thin structural partition (round window membrane) that separates the air-filled middle ear space from the fluid-filled inner ear compartment. We found they do make it into the cochlea, and once inside, they traveled throughout the breadth of the cochlea in a time-dependent manner. These results suggest we can take advantage of a less-invasive, clinically- applicable middle ear administration route for administering our medicinal technologies to their target site in the cochlea. Once we knew the nanoparticles would travel from the gel solution into the cochlea, we developed methods to specifically measure the siRNA’s success in regenerating hair cells in single cochlear preparations. This allowed us to expand our evaluations to determine the actual amount of drug that enters the cochlea through the middle ear and what it did once it reached the target cells. Using this methodology and a middle ear delivery approach, we demonstrated enough of our medicinal nanoparticles made it into the cochlear tissue and delivered enough therapeutic compounds to regenerate hair cells in the correct amount of time for greatest therapeutic results. Currently, we are using this information to refine our delivery approach and timing of administration for maximum results. We are excited to see our ideas move from the drawing board to reality because it will stream-line the clinical implementation of our technologies and open new doors for future discovery.